Wellington is the capital of New Zealand, situated at the southwestern tip of the North Island between Cook Strait and the Rimutaka Range. The Wellington Urban Area is the major population centre of the southern North Island and ranks as New Zealand's third most populous urban area with 381,900 residents. 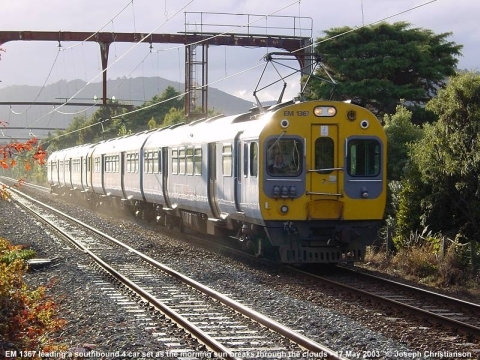 There are 473,700 residents in the Wellington Region (June 2008 estimates). Wellington's suburbs lie across four cities. Wellington City, on the peninsula between Cook Strait and Wellington Harbour, contains the central business district and about half of Wellington's population. 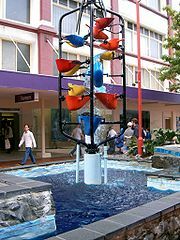 Porirua City is situated on Porirua Harbour to the north and is notable for its large Māori and Pacific Island communities. Lower Hutt City and Upper Hutt City are suburban areas to the northeast, together known as the Hutt Valley. Although each of the four cities also contains a rural hinterland, almost all of the population is within the urban area. Art Ferns & Civic Square. Wellington was named in honour of Arthur Wellesley, the first Duke of Wellington and victor of the Battle of Waterloo. The Duke's title comes from the town of Wellington in the English county of Somerset. In Māori, Wellington goes by three names. Te Whanga-nui-a-Tara refers to Wellington Harbour and means "the great harbour of Tara". Pōneke is a transliteration of Port Nick, short for Port Nicholson (the city's central marae, the community supporting it and its kapa haka have the pseudo-tribal name of Ngāti Pōneke). Te Upoko-o-te-Ika-a-Māui, meaning The Head of the Fish of Māui (often shortened to Te Upoko-o-te-Ika), a traditional name for the southernmost part of the North Island, derives from the legend of the fishing up of the island by the demigod Māui. Wellington also goes by a number of nicknames including The Harbour Capital, Wellywood and the Windy City. 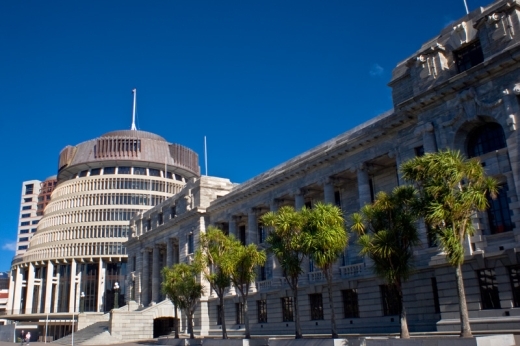 Wellington is New Zealand's political centre, housing Parliament and the head offices of all Government Ministries and Departments, plus the bulk of the foreign diplomatic missions that are based in New Zealand. 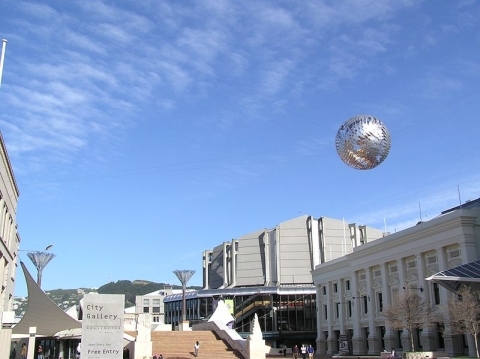 Wellington's compact city centre supports an arts scene, café culture and nightlife much larger than most cities of a similar size. It is a centre of New Zealand's film and theatre industry. 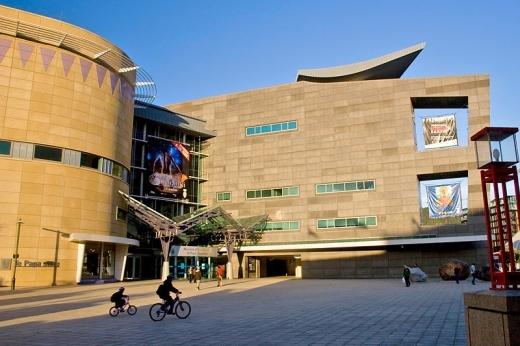 Te Papa Tongarewa (the Museum of New Zealand), the New Zealand Symphony Orchestra, the Royal New Zealand Ballet, Museum of Wellington City & Sea and the biennial New Zealand International Arts Festival are all sited there. Wellington has the 12th best quality of living in the world, according to a 2007 study by consulting company Mercer. Of cities with English as the primary language, Wellington ranked fourth. Only Auckland of New Zealand cities rated higher as it was ranked fifth in the world in 2006 and 2007. European settlement began with the arrival of an advance party of the New Zealand Company on the ship Tory, on 20 September 1839, followed by 150 settlers on the Aurora on 22 January 1840. Supreme Court of New Zealand. The settlers constructed their first homes at Petone (which they called Britannia for a time) on the flat area at the mouth of the Hutt River. When that proved swampy and flood-prone they transplanted the plans, which had been drawn without regard for the hilly terrain. Wellington suffered serious damage in a series of earthquakes in 1848 and from another earthquake in 1855. 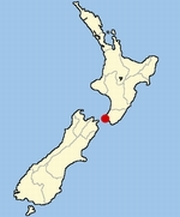 The 1855 Wairarapa earthquake occurred on a fault line to the north and east of Wellington. It ranks as probably the most powerful earthquake in recorded New Zealand history, with an estimated magnitude of at least 8.2 on the Richter scale. It caused vertical movements of two to three metres over a large area, including raising an area of land out of the harbour and turning it into a tidal swamp. Much of this land was subsequently reclaimed and is now part of Wellington's central business district. For this reason the street named Lambton Quay now runs 100 to 200 metres (325 to 650 ft) from the harbour. Plaques set into the footpath along Lambton Quay mark the shoreline in 1840 and thus indicate the extent of the uplift and of subsequent reclamation. The area has high seismic activity even by New Zealand standards, with a major fault line running through the centre of the city, and several others nearby. Several hundred more minor fault lines have been identified within the urban area. The inhabitants, particularly those in high-rise buildings, typically notice several earthquakes every year. For many years after the 1855 earthquake, the majority of buildings constructed in Wellington were made entirely from wood. The 1996-restored Government Buildings, near Parliament is the largest wooden office building in the Southern Hemisphere. While masonry and structural steel have subsequently been used in building construction, especially for office buildings, timber framing remains the primary structural component of almost all residential construction. Residents also place their hopes of survival in good building regulations, which gradually became more stringent in the course of the twentieth century. In 1865, Wellington became the capital of New Zealand, replacing Auckland, where William Hobson had established his capital in 1841. Parliament first sat in Wellington on 7 July 1862, but the city did not become the official capital for some time. In November 1863 the Premier Alfred Domett moved a resolution before Parliament (in Auckland) that "... it has become necessary that the seat of government ... should be transferred to some suitable locality in Cook Strait." Apparently there was concern that the southern regions, where the gold fields were located, would form a separate colony. Commissioners from Australia (chosen for their neutral status) pronounced the opinion that Wellington was suitable because of its harbour and central location. Parliament officially sat in Wellington for the first time on 26 July 1865. The population of Wellington was then 4,900. Wellington is the seat of New Zealand's highest court, the Supreme Court of New Zealand. 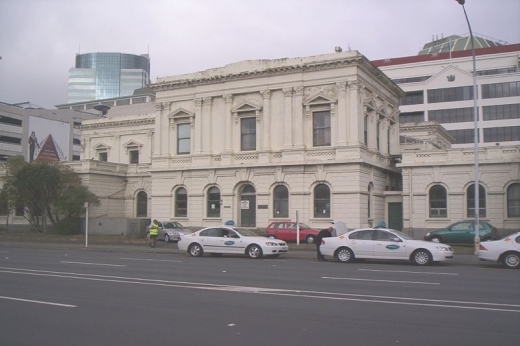 The historic former High Court building is to be enlarged and restored for the court's use. Wellington stands at the south-western tip of the North Island on Cook Strait, the passage that separates the North and South Islands. On a clear day the snow capped Kaikoura Ranges are visible to the south across the strait. To the north stretch the golden beaches of the Kapiti Coast. On the east the Rimutaka Range divides Wellington from the broad plains of the Wairarapa, a wine region of national acclaim. With a latitude of about 41° 17' S, Wellington is the southernmost national capital city in the world. It is also the most remote capital in the World (i.e. the furthest from any other capital). 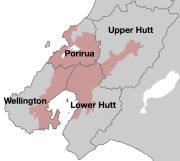 It is more densely populated than most other settlements in New Zealand, due to the small amount of building space available between the harbour and the surrounding hills. Wellington has very few suitable areas in which to expand and this has resulted in the development of the surrounding cities in the greater urban area. Because of its location in the roaring forties latitudes and its exposure to omnipresent winds coming through Cook Strait, the city is known to Kiwis as "Windy Wellington". 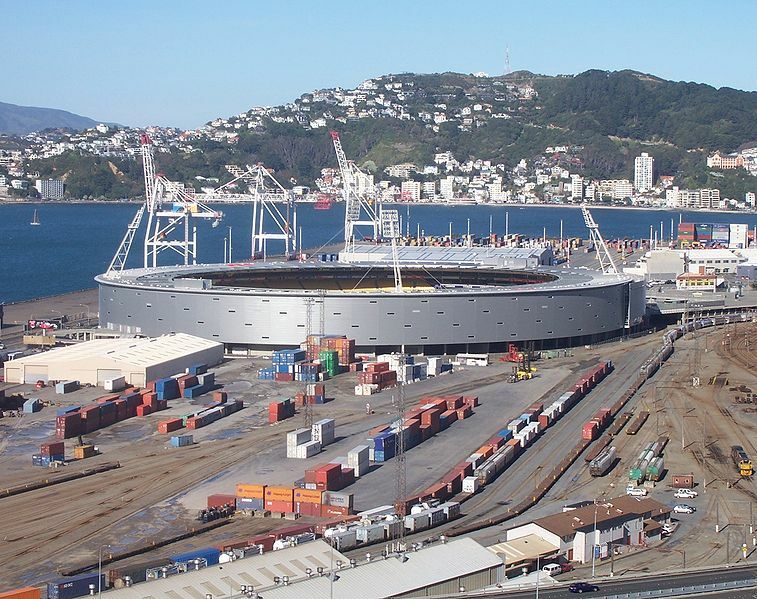 More than most cities, life in Wellington is dominated by its central business district (CBD). Approximately 62,000 people work in the CBD, only 4,000 fewer than work in Auckland's CBD, despite that city having three times Wellington's population. Wellington's cultural and nightlife venues concentrate in Courtenay Place and surroundings located in the southern part of the CBD, making the inner city suburb of Te Aro the largest entertainment destination in New Zealand. Wellington has a median income well above the average in New Zealand and a much higher proportion of people with tertiary qualifications than the national average. Wellington has a reputation for its picturesque natural harbour and green hillsides adorned with tiered suburbs of colonial villas. The CBD is sited close to Lambton Harbour, an arm of Wellington Harbour. Wellington Harbour lies along an active geological fault, which is clearly evident on its straight western coast. The land to the west of this rises abruptly, meaning that many of Wellington's suburbs sit high above the centre of the city. There is a network of bush walks and reserves maintained by the Wellington City Council and local volunteers. The Wellington region has 500 square kilometres (190 sq mi) of regional parks and forests. In the east is the Miramar Peninsula, connected to the rest of the city by a low-lying isthmus at Rongotai, the site of Wellington International Airport. The narrow entrance to Wellington is directly to the east of the Miramar Peninsula, and contains the dangerous shallows of Barrett Reef, where many ships have been wrecked (most famously the inter-island ferry Wahine in 1968). On the hill west of the city centre are Victoria University and Wellington Botanic Garden. 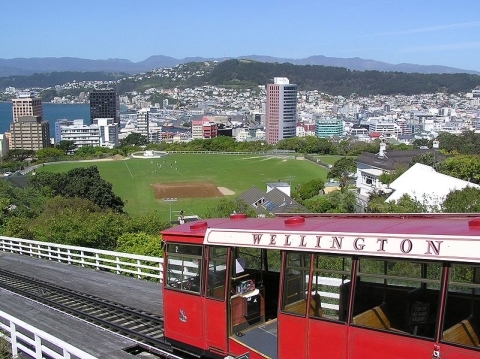 Both can be reached by a funicular railway, the Wellington Cable Car. Wellington Harbour has three islands: Matiu/Somes Island, Makaro/Ward Island and Mokopuna Island. Only Matiu/Somes Island is large enough for settlement. It has been used as a quarantine station for people and animals and as an internment camp during the First and Second World Wars. It is now a conservation island, providing refuge for endangered species, much like Kapiti Island further up the coast. There is access during daylight hours by the Dominion Post Ferry. Night panorama of the city centre taken from Mt. Victoria. Panorama of the city centre taken from Mt. Victoria.